Origination of the loan is relatively simple. As a result of local law, custom, and procedure however, closing that loan may be quite another story. In Massachusetts, real estate closings can only be conducted by attorneys. The closing attorney orders and reviews the title examination, obtains a municipal lien certificate to determine the existence of outstanding taxes, and obtains a mortgage plot plan survey of the property. The attorney conducts the closing, certifies the title, records the documents at the local Registry of Deeds and issues title insurance. In short, the closing attorney provides virtually all of the necessary services in connection with the conveyance of title and the placing of the mortgage. Since the practice and procedure surrounding real estate conveyancing and mortgage lending in Massachusetts is somewhat confusing and unique to this state, it is difficult for the out-of-state lender to be acquainted with all of our particular methods of practice. Because of this, some on-line lenders have been placing the burden of securing the title and closing services on the borrower. This becomes problematic since too often the borrower does not know which attorneys are proficient at real estate conveyancing practice. Too many attorneys "dabble" in conveyancing and don't specialize - yet few attorneys will turn away the business when approached. The lender should not have to "train" the attorney. Additionally, it can be a bewildering and burdensome process for the borrower to be saddled with the responsibility of having to search for appropriate closing services when their local bank provides that service as a matter of common practice. Time always becomes an issue as the closing date approaches and inappropriate decisions can be made. Deciding on the wrong closing agent can cause expense, confusion and delay. The result, is an overwhelmed consumer with an aversion to the internet borrowing experience, and a frustrated lender who is constantly re-acquainting a variety of unfamiliar closing agents with the lender's procedures and requirements. It is certainly preferable, from the lender's perspective to have pre-designated closing services in place with one known and reliable source, rather than to waste valuable time and resources dealing with that issue on a continual basis for each and every loan transaction. Whether the Lender is relying on the consumer to locate closing services or whether you, the online lender is seeking to end the confusion caused by that reliance, Barr and Cole is your perfect "one stop" source for real estate closing services in Massachusetts. Barr and Cole is a ready and proven source for real estate closing services. We are a fully experienced real estate law firm - yet we are not plagued by the typical law firm distractions. Our focus is real estate closings. This is predominantly all that we do. Our attorneys are not "held up in Court", probating estates, or forming corporations. We are a business, but with the experience and know-how of the traditional law office, and we have full title insurance and certification authority. Barr and Cole also offers full buyer services such as Purchase and Sale Agreement negotiation and review. Our service can reduce closing costs as we are able to represent both the lender and the borrower at one low fee. When Barr and Cole is designated as the closing agent, whether by referral of the borrower, or by pre-designation from the lender, the procedural issues are simple. The borrower does nothing. All matters of conveyance are handled between the lender and us. If we are not already the pre-designated closing agent for the lender then the borrower should notify the lender that they wish Barr and Cole to be the closing agent for their particular transaction. The lender will then contact us directly. Upon completion of the application process, the Lender will fax or email a "Title Order" to us containing the names and telephone numbers of the parties and the brokers, as well as the address of the locus property (or a copy of the purchase and sale agreement). We will take it from there. 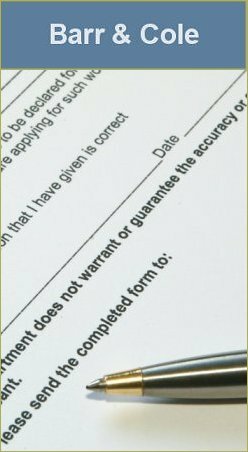 We will order the title examination, the survey, and the municipal lien certificate. We will communicate with the parties regarding scheduling and closing issues. We will conduct the closing (either at our offices or any other location convenient to all the parties), and we will return the fully executed closed loan documents to the lender's office along with the final title insurance policy. Either we can provide the loan documents or the lender can, depending on the lender's own preference and procedures. Barr and Cole conducts real estate closings in every county in Eastern and Central Massachusetts including Suffolk County, Norfolk County, Middlesex County, Plymouth County, Essex County, Bristol County, Hampden County and Worcester County. We have affiliation with title examiners and land surveyors in all of these counties enabling us to proceed with closings on relatively short notice and in a wide geographic area. We can also provide local appraisal and flood certification services upon request. We look forward to being able to provide you Title and Escrow Services in Massachusetts.